In order to synthesize current knowledge on salmon conservation and recovery efforts, the Atlantic Salmon Federation (ASF) is hosting an international conference that will bring together scientists, stakeholder groups, and conservation managers from across North America and the E.U. A 'smolt wheel' is used by researchers to collect salmon smolt as they migrate from freshwater to the sea. For those interested in salmon recovery, knowing what doesn't work is equally as important as knowing what does. When it comes to the recovery of wild Atlantic salmon stocks, the question on the minds of conservation managers and the public alike is “what works?” In order to synthesize current knowledge on salmon recovery, the Atlantic Salmon Federation (ASF) is hosting an international workshop that brings together stakeholder groups, scientists, and managers to assess Atlantic salmon recovery programs across Eastern North America. International speakers and participants have been attracted to the conference, which will be held in Chamcook, N.B. on September 18-19, 2013. The conference will focus on applied Atlantic salmon research, with 32 presenters from diverse backgrounds sharing their experiences of successes, failures, and best practices for rebuilding depleted and threatened wild salmon populations. 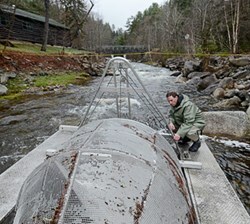 Mr. Carr says that this represents a unique learning opportunity for participants that are already working on or are considering recovery options for their local salmon populations. “There exists a great deal of peer-reviewed, published research on salmon conservation, but recovery programs and strategies that were not successful rarely get published; for those interested in salmon recovery, knowing what doesn't work is equally as important as knowing what does,” explains Carr. Amongst the 80 attendees are Dennis Ensing, Senior Scientist at the Agri-Food and Biosciences Institute Northern Ireland and Ivor Llewelyn, Director of the Atlantic Salmon Trust (England and Wales). Carr says that conservation efforts in North America are linked to those efforts in the European Union, since salmon from both sides of the Atlantic aggregate and feed together during the winter months, where they are subject to the same international fishing pressures, and ecosystem-wide climate changes. A key outcome of the recovery workshop will be the development of a classification system for salmon recovery programs that will identify population status and associated threats, life history attributes, action plans, program goals, and measures for evaluating the success of recovery programs. From the workshop proceedings, recommendations will be developed on best practices for salmon recovery, for both local populations and for the species as a whole.